Our Workforce - Monona Chamber & Economic Development, Inc.
Work Force. The work force in Monona is one a business owner can depend on because of the hard-working, ethical values in which people were raised with in this area of the Midwest. A recent survey conducted by the Iowa Department of Employment Services for Clayton County, Iowa shows 51 percent of all persons included in the survey had worked for their current or most-recent employer for more than five years. Also, 88 percent of persons surveyed are high school graduates and 43 percent of those surveyed had some college education. Eighty-one percent of those surveyed in Clayton County are ready to learn new skills and 46 percent are willing to share in training costs. Industries have chosen to locate in Monona based on their decision on the high-quality work performed by area employees and the high degree of productivity they receive. In the competitive climate in which all businesses operate, employers are finding that the combination of high productivity + low costs + dependability = above average net profit in Monona, Iowa. Economic and Industrial Development. Monona is able to take advantage of the new programs for Economic and Industrial Development put forth by the State of Iowa. For a full listing and description of the available programs, contact the Monona Chamber & Economic Development, Inc. (MCED) office at (563) 539-8340, City of Monona at (563) 539-2355, or the Iowa Department of Economic Development (IDED) at 200 East Grand Avenue, Des Moines, IA 50309 or call IDED at (515) 281-3251. Central Time Zone Location. Monona, Iowa is centrally located within the Central Time Zone. This is most-efficient for a business to conduct its daily operations, standard business hours, communications, customer service, shipping, etc. Business travel time and distance may be lessened when traveling to east and west coasts and all points in between while conducting business in Pacific, Mountain, Central, and East Time Zones. Monona Municipal Airport. Monona has its own municipal airport with a 3,000’ runway with 24-hour accessibility for flights to and from Dubuque, IA; Cedar Rapids, IA; and LaCrosse, WI commercial airline services (click here to find more about Monona Municipal Airport). Single Factor Corporate Income Tax. Iowa is the only state with a single factor corporate income tax - meaning only the profits from products sold for delivery in the state are taxed. Federal Tax Deduction. Iowa's corporate income tax allows a 50 percent deductibility of federal taxes from Iowa corporate income tax. Tax Abatement. The City of Monona offers an exemption from property taxation on new construction of industrial real estate. It is a ten-year graduated property tax exemption on value-added improvements. Tax Increment Financing. TIF is a very flexible tool which allows the city to use the increased property tax dollars generated from new development to assist your company. This flexible tool can be used for such things as machinery and equipment and construction, interest buy downs and local matching funds. Grants and Loans. 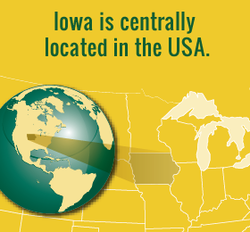 Grants and Loans are provided for economic development projects which create Iowa jobs. Proceeds may be used to purchase land, buildings, machinery, inventory or equipment. Funds may also be used for working capital for operating expenses, research and development. Property Tax Exemptions. In Iowa, cities and counties are allowed to give industries tax exemptions for the actual value added to industrial real estate through new construction and buying or improving machinery and equipment assessed as real estate. Right to Work Law. Iowa gives employees the right to work in all settings. Workers choose whether to belong to a union. Industrial Training. The Iowa Jobs Training Program provides on the Job training and any other services that may be necessary to train employees. An employer may be reimbursed 50 percent of the new employee's wages during this training period. All firms that produce products or provide services in interstate commerce are eligible.